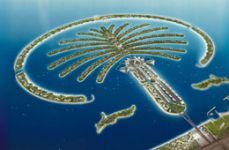 The Dubai Palm Islands are three man made islands in the shape of palm trees attached to the Dubai coastline via the trunk of each palm, being developed by Nakheel Properties. The first to be constructed is The Palm, Jumeirah which was expected to be fully developed by the end of 2008, but construction delays and financial crisis in 2008-2009 will probably set that back to 2011 or later, with some projects on the island possibly abandoned altogether (the Dubai Trump Tower being one example). 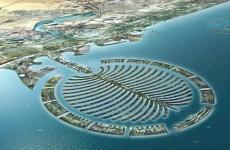 All three islands will add substantial amounts of shoreline to the Dubai coast. On the islands will be a range of accommodation including private villas and apartments for rent or sale, hotel resorts, holiday apartments. Other amenities will include shopping centers, restaurants and water sports facilities. PO Box 17777, Dubai UAE. Tel +971-4-3903333. Location of Nakheel office is near the entrance to Jumeirah Palm, Dubai (Next to Sheikh Mohammed's Beach Palace). Has displays of the Palm Islands and other Nakheel projects. See the Jumeirah Palm page for more information. The Jumeirah Palm was the first Palm Island to be constructed, with land reclamation beginning in 2005. As of end 2007, residents have moved in to their villas on the fronds and apartments on the main trunk. Construction is still going on with resorts and shops taking shape. Jebel Ali Palm is the second of the Palm Trilogy to be constructed and is larger than the Palm Jumeirah with an inner and outer ring surrounding the fronds. The Palm Deira is the largest of the three islands in the Palm Trilogy, and is to be constructed near Port Rashid with access to Dubai on the Deira side of the Shindagha Tunnel. In November 2011, there appeared to be an Italian invasion of the island - an Italian military plane which had attended the Dubai Airshow crashed on the island after taking off from Dubai Airport. There was was a news report 12 May 2005 saying that Nakheel was in secret talks to develop a 4th Palm Island for a Disneyland theme park in Dubai. No further information received or found about the plans. Source of report unknown, and it might have been fictional. If it had been published on 01 April 2005, most people would probably have written it off as an April Fool's joke. Then again, doesn't sound much less believeable than many other press releases coming out of Dubai and the UAE announcing spectacular property developments and other projects (not just from Nakheel). 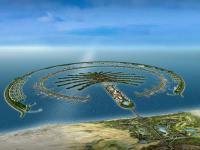 Nakheel Properties - developer of the Palm Islands project. 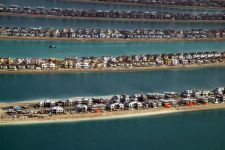 Where to live in Dubai - there are other places to live in Dubai if you can't afford the rent on one of the Palm Islands. www.thepalm.ae - Palm trilogy website (Palm Jumeirah, Palm Jebel Ali, Palm Deira). Not available Aug 2014, try www.nakheel.ae. www.dubaifaqs.com/palm-islands-dubai.php (PDF and print version).